With the World Health Organization (WHO) to stage a dialogue with the sport and exercise industries on its Global Action Plan for Physical Activity (GAPPA), Fitness Australia is of the event being held in Switzerland later this month. Joel Perricone, Fitness Australia’s National Manager, Advocacy and Partnerships, has been invited to attend the WHO Dialogue with the Sports Industry on the Implementation of the Global Action Plan on Physical Activity 2018-2030, to be held in Geneva on 25th and 26th February 2019. Commenting on his upcoming involvement in the Dialogue, Perricone (pictured below) advised “it’s a tremendous honour for me to be taking the opportunity to showcase the great work of the Australian fitness industry in front of a global audience. Launched in June last year, the GAPPA sets out four objectives and recommends 20 policy actions that are applicable to all countries and address the cultural, environmental and individual determinants of inactivity. The objective of the Dialogue is to build knowledge (through evaluation and market research); begin a global communications campaign on physical activity; commence joint initiatives to address priority issues and population such as inequalities in participation by girls, women, disadvantaged communities and people living with disabilities; and to identify joint initiatives to demonstrate whole of community approach to GAPPA implementation in a set of target countries. Participation in the Dialogue, which is through invitation only, will include about 20 representatives from the sports industry, including apparel, equipment, fitness and gym industries, and senior WHO officials. Since the GAPPA was endorsed and adopted last year, the WHO has launched a new campaign, Let’s Be Active, and a new report in collaboration with the Lancet on global physical activity trends from 2001-2016. This year it plans to develop a GAPPA Global Monitoring and Evaluation Framework to track progress towards reaching its targets, and guidelines on physical activity among under fives, youth, adults and older adults, as well as finalising international translations of the GAPPA documents. 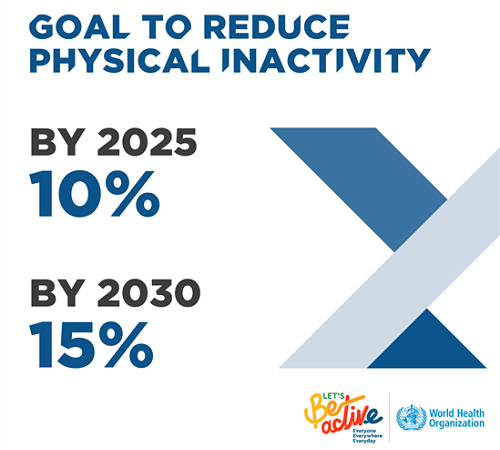 Click here for more information about the WHO Global Action Plan on Physical Activity and Health 2018-2030: More active people for a healthier world.